America continues to witness men and women of color being gunned down in the streets by law enforcement. Whether tending to a stalled vehicle or simply reading inside their car before picking up children from school, these victims are treated as stereotypes rather than as human beings. As a Black father, husband, and Muslim living on Chicago’s South Side, I know firsthand the unfortunate realities of police officers’ implicit biases. Those biases are compounded by the structural racism and discrimination, devastating community disinvestment, failing schools, and economic despair. This is why I organize at IMAN. The issue is bigger than improved policing. The job at hand is to rebuild broken neighborhoods and uplift our fellow community members whose lived experiences are burdened by hopelessness and desperation. I believe Muslims have a critical role to play in helping to strengthen institutions like IMAN and support our inner cities in the struggle for equity and justice. It is easy to become frustrated by the seemingly endless news of gun violence in Chicago and police brutality nationwide, but constructively engaging with community organizations can channel that frustration into meaningful action and, God willing, lasting improvements. IMAN continues to tackle crucial issues with campaigns focused on criminal justice reform that counters the criminalization of black and brown communities. Just this year, our organizers succeeded in getting the Removing Invisible Bars Act passed, a significant step forward in Illinois’ parole reform efforts. As the U.S. Muslim community asserts its rightful place in the American experience, we cannot lose sight of the need to make relevant impact on the people we live with and in the spaces we navigate. One path to relevance is through maintaining real solidarity in the ‘hood, and IMAN’s Corner Store Campaign has provided a vehicle to do just that for years now. Utilizing our resources in expertise to help restore viable job opportunities, holistic health improvements and harmonious interpersonal relationships promises to be a fruitful investment. The real work begins when we are able to see our stories and ourselves in others; then we can truly want for our brothers and sisters that which we want for ourselves. That’s how lasting solidarity is built, and there is no better time to start this journey than right now. The arrival of Whole Foods Market was met with great anticipation from our leaders and allies in the Greater Englewood area. For years, IMAN and partner organizations have tackled food access issues on the South Side of Chicago with a holistic approach: by holding larger corporations more accountable to the local community needs, increasing the availability of fresh and healthy foods, expanding nutrition education resources, and serving as an incubator for local entrepreneurship. 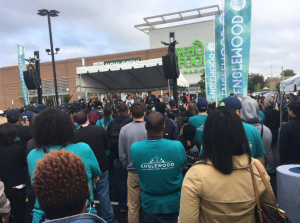 IMAN has long worked to revitalize food ecosystems in Englewood and other South Side communities through its Corner Store Campaign, which currently engages over 60 stores. As an organization deeply rooted in this community, IMAN understands that fostering alternative business models requires strong connections between food access, corner store intervention, urban agriculture, and public safety. For more information on how IMAN food justice organizers plan to engage Whole Foods in the larger community-wide campaign to improve health and wellness in South Side communities, please contact Organizing Director Shamar Hemphill at shamar@imancentral.org. In exciting news, IMAN’s Executive Director, Rami Nashashibi, was selected to serve as a member of President Obama’s Advisory Council on Faith-Based and Neighborhood Partnerships. Nashashibi’s appointment to the council is a direct result of the collective work that IMAN has done over the past two decades, during which the organization has grown into a nationally recognized model built on alliances across ethnic, socioeconomic and religious lines. 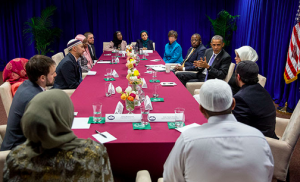 The council brings together leaders and experts from across the country who specialize in faith-based and neighborhood organizations in order to make recommendations to the Obama Administration. Current goals include reducing poverty and inequality, creating more opportunities for all citizens, and adapting policies, programs, and practices that affect the delivery of services by faith-based and community organizations to low-income and other underserved populations. Driven by the same ideals that have powered IMAN’s work, Nashashibi hopes to not only attract greater attention to the organization’s model and accomplishments, but more importantly shine more light on the issues and causes that IMAN has addressed for nearly 20 years. In response to the unconscionable attack on 71-year-old Fred Laguardia following Labor Day Weekend, IMAN helped mobilize a diverse group of religious and community leaders from the larger Marquette Park area to welcome home their beloved fellow citizen and pledge support to his family. A community-organized press conference took place at 7045 South California Avenue, the site of Mr. Laguardia’s attack, during which family members and representatives from the larger community spoke passionately about the urgent need to stand together and stem the rising tide of violence in communities like Marquette Park, and other areas across the city. 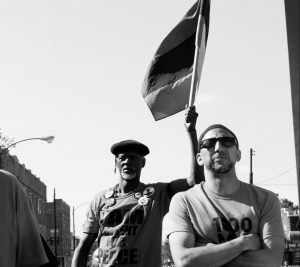 Chicago anti-violence activist Andrew Holmes and his organization helped raise much of the $10,000 reward from groups and individuals across Chicago. The money will be used to encourage information leading to the arrest of Laguardia’s attackers. Other local institutions in support include: Beth Shalom Synagogue, Sisters of St.Casimir, Southwest Organizing Project (SWOP), Holy Cross Hospital, Maria Catalyst School, Ephraim Bahar Community Center, Chicago Islamic Center, St. Rita of Cascia Parish and more.